Fudge Topped Brownies are the ultimate chocolate dessert. 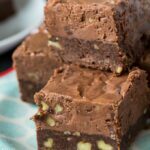 If you love brownies and you love fudge, Fudge Topped Brownies are double the deliciousness! On the bottom there’s a fudgy layer of brownie with a deep chocolate flavor and some walnuts. On top there’s a sky high layer of rich, chocolate fudge with more walnuts. 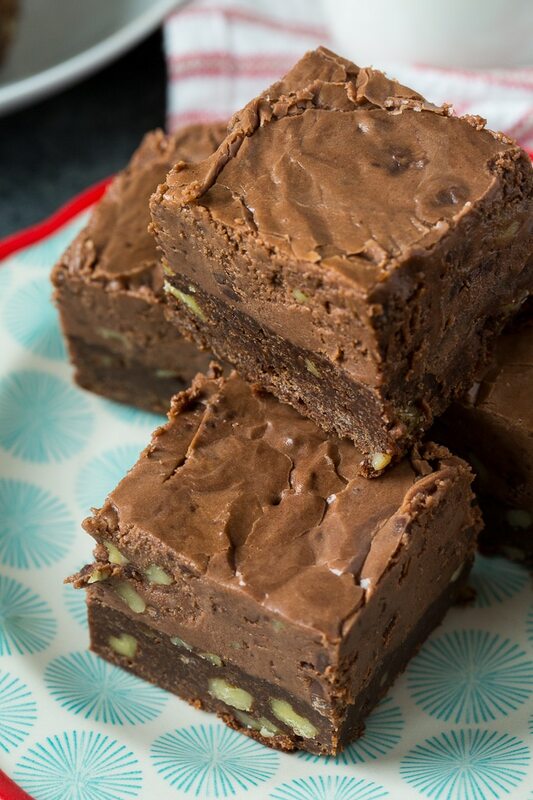 You need a serious sweet tooth to eat these over the top brownies! I made these Fudge Topped Brownies recently for a bake sale my daughter was helping with for a club she participates in at the College of Charleston. It wasn’t your typical bake sale and these aren’t your typical bake sale brownies. It took place from 10pm to 2am on King St in Charleston. They sold out of everything they had and they had a ton of goodies. People must have had the munchies! This recipe is great for a bake sale because it makes a huge batch and can be cut into a gazillion pieces. It’s thick and oh so rich and one of the best desserts ever! 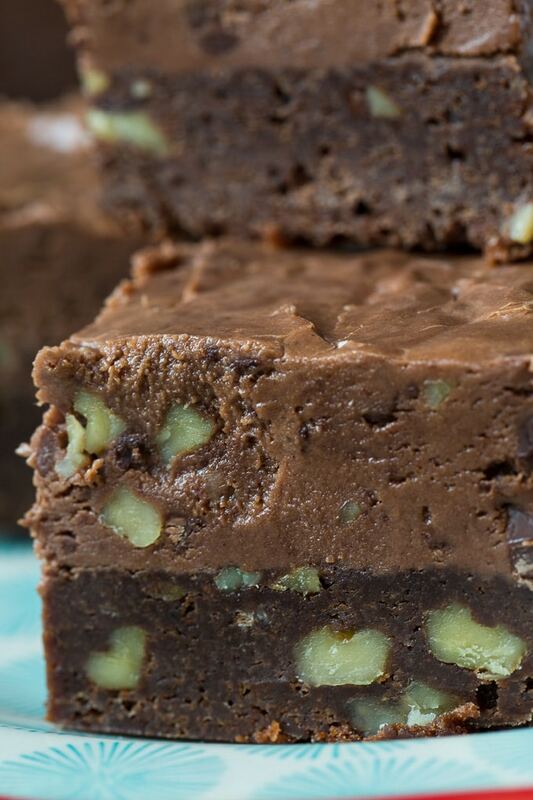 A chewy brownie with walnuts is covered with a thick layer of rich fudge. Preheat oven to 350 degrees and line a 9x13-inch pan with foil. Lightly grease foil. Melt butter and chocolate in a heavy saucepan. Stir until smooth. Remove from heat. Whisk in sugar and vanilla. Combine flour, baking powder, and salt and stir into chocolate mixture until combined. Pour batter into prepared pan and bake 25 to 30 minutes. To make fudge, combine sugar, evaporated milk, and butter in a large heavy saucepan. Bring to a boil over medium heat. Reduce heat and simmer for 5 minutes, stirring constantly. Remove from heat and stir in chocolate chips, marshmallow creme, and vanilla until smooth. 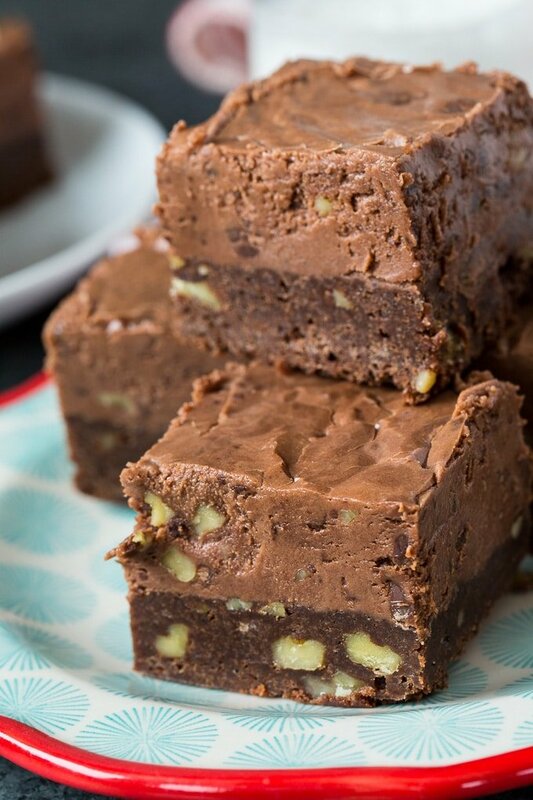 Stir in walnuts and pour on top of warm brownies. Place in freezer for 2 to 3 hours to firm it up before cutting into squares. If you’re a brownie lover, these Peanut Butter Mississippi Mud Brownies are a must try!. Watch the video below to see how to make them. This entry was posted in Brownies and Bars and tagged brownies, chocolate, fudge. Bookmark the permalink. If made as described, that recipe has 8 -1/2 cups of sugar in it, plus marshmallow cream (=more sugar) and chocolate chips (=more sugar). Even if you cut this into small pieces and many of them, you are still getting a lot of sugar. We all need to think very carefully before eating things like this and that can be challenging because they are very appealing. Think, people!